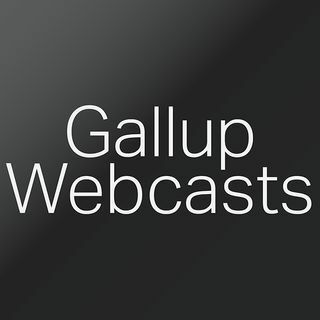 An audio feed for all the Webcasts offered by Gallup Inc. Featuring tiles from Called to Coach, Theme Thursday and The Gallup Podcast. Para conocer más sobre la Certificación de Coach en Fortalezas visite el Centro de Fortalezas Gallup Gallup Strengths Center: http://on.gallup.com/1i5OXhq. El llamado del Coach de Fortalezas Gallup, es una transmisión en vivo para los coaches actuales y prospectos en el que pueden interactuar con expertos de Gallup y coaches de ... Maggiori informazioni fortalezas independientes, quienes han encontrado éxito en el desarrollo basado en fortalezas. Builder Talent Tuesday is a Gallup Webcast series that dives deep into the Builder Profile Talents, one Talent at a time. Called to Coach is a webcast resource for those who want to help others discover and use their CliftonStrengths. We have Gallup experts and independent strengths coaches share tactics, insights and strategies to help coaches maximize the talent of individuals, teams and organizations around the world. Gallup is leading an important initiative in education to create a process of continuous improvement to put strengths-based strategies in place that drive great jobs and great lives for college graduates. Our work with colleges and universities is grounded in more than four decades of research and discovery; we are committed to building ... Maggiori informazioni a better benchmark for engaging students. Strengths Explorer is a podcast series that dives deep into the ten talent themes of the Clifton Youth Strengths Explorer. Designed for adults who are interested in accepting, affirming, and growing the individual potential within a child, this series expands your language to describe what is right and strong in children ages 10-14. To ... Maggiori informazioni further your understanding, check out Gallup’s book “Strengths-Based Parenting,” available at http://shop.gallup.com or where ever books are sold. El Tema del día es una serie de programas que profundiza en los Temas de Talento de CliftonStrenghts, uno a la vez. Puede participar con nosotros en el programa o descargar los audios y videos para escucharlos aún fuera de línea en http://coaching.gallup.com. Theme Thursday is a Gallup Webcast series that dives deep into the CliftonStrengths Themes, one theme at a time. Catch all the LIVE Gallup Webcast episodes here. Unedited and uncut versions.